The Santa Rosa Junior College theatre season ends with a production of James Lapine and Stephen Sondheim’s Into the Woods. It’s a fairy tale mash-up with elements of Cinderella, Rapunzel, Jack and the Beanstalk and Little Red Riding Hood set to a classic Sondheim score. As in the original tales – and not like most adaptations – things do not end well for the characters. With the JC’s Burbank Auditorium undergoing renovations, the limitations of the high school auditorium utilized for this production led director Laura Downing-Lee and her design team to get even more inventive than usual. They’ve reached back to the source material and set the show in a library. Scenic designer Peter Crompton loads the stage with oversized books that work as doors and steps. Other library materials are ingeniously worked into scenes – flapping books as birds, library carts as horses, etc. Under the vocal direction of Jody Benecke and musical direction of Justin Pyne and a nine-piece offstage orchestra, the creatively-costumed cast did well with the often-challenging Sondheim score. Mollard, Smith, and Weatherby lead the talented ensemble which includes Levi Sterling as Jack, Serena Poggi as Little Red Riding Hood, Ella Park as Cinderella, Shayla Nordby as Rapunzel and Cooper Bennet and Roberto Perez Kempton as Princes who were “raised to be charming, not sincere”. Unfortunately, the opening night performance was marred by numerous technical difficulties. Erratic microphone work and a failing projection system really distracted from the fine work being done onstage. My wish is that they get it all fixed so that audiences can fully enjoy this very entertaining production. 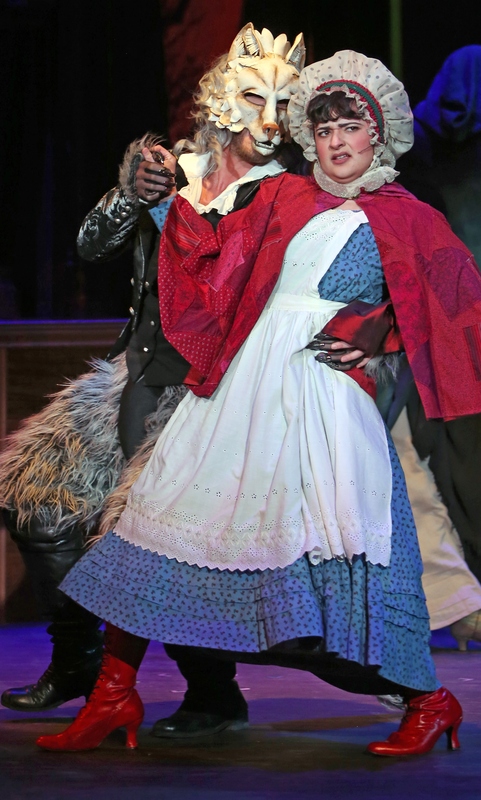 ‘Into the Woods’ runs through May 6 at Maria Carrillo High School Theatre, 6975 Montecito Blvd., Santa Rosa. Recommended for ages 12 and above. Thursday -Saturday, 7:30pm; Sunday, 1:30pm; $10–$22. 707.527.4307.